We all know Doom is about speed, but Doom’s speedrunners take that fact and, quite literally, run with it. 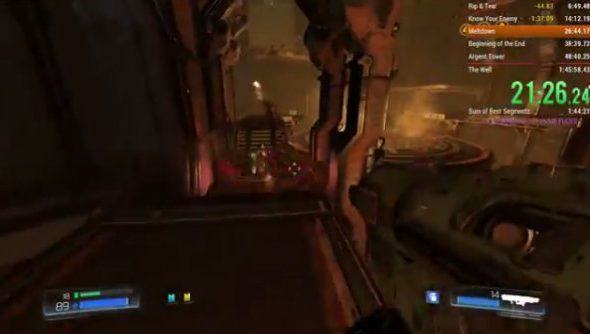 It’s mesmerising to watch someone play Doom at this level – it’s a balletic, bullet-filled death dance and it’s hard to look away. Doom is easily one of the best shooters of recent times, but here’s a bunch more in our list of PC’s best FPS games. I find speedrunning impressive enough at the best of times, seeing all the little tricks they use to shave off precious seconds, but there are a fair few instances in new Doom where the game just locks you in a room and makes you kill a bunch of demons to progress. You certainly can’t just run past everything here, so there’s more than a little bit of skill required. Outside of those demon arenas, I think your biggest nemesis as a Doom speedrunner is the doors. I love how id Software have developed one of the slickest, most fast-paced shooters of recent times and then they’ve filled it with the slowest opening doors in the world. Some of them do have Vault-Tec branding, mind you. Anyway, watch this world record run from speedrunner DraQu, which clocks in at 90 minutes and 54 seconds. He’s gone one further since, registering another world record on Nightmare difficulty, with a time of 101 minutes and 45 seconds. He only died once in the entire run. If you’re not as bothered about speed but you enjoy watching someone skilled, Zero Master managed to record the world’s first Ultra Nightmare run – a permadeath mode on Doom’s hardest difficulty. Have a watch of that below because it’s kind of beautiful.